In this magical land of heroes, villains, and adventurers, a fragile peace has been brokered between the Five Realms. Five years have passed since the evil Lord Dranor escaped from The Cavern Tavern. The Elf Princess Tabita Orestes has taken her rightful place as the High Queen of the Five Realms and has built a new capital: the white-walled city of Caveborn. 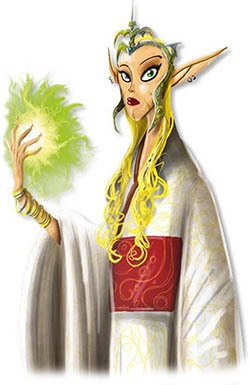 Caveborn is her one chance to make peace work-to heal the division Lord Dranor caused and to keep the unity among the races: the Halflings, Humans, Elves, Dwarves, Green Elves, and Trobits. So Queen Tabita formed the Stone Council and invited one representative from each race to sit on the Council. The unofficial head of the Stone Council is Berk the Town Clerk, one of the nicest administrators you would ever wish to meet. So nice and unassertive, in fact, that people are grumbling that the Queen should send him back to the royal library. The city needs a more confident and qualified leader, not a historian! Can you help Caveborn flourish and prosper under the new Queen and prove that you deserve Berk the Clerk's seat on The Stone Council? The board represents the newly built town of Caveborn. You can choose to play the standard game on either the Day side or the Night side of the board. Once you've placed the board on the table, place the Round Marker on the "1" space on the Round track. Shuffle the Ship tiles and place them face down near the board. Place 1 tile face up next to the port on the main board. Shuffle the Stone Council tiles and place them face down near the board. Place 1 tile face up on each slot in the Council. Consult the Setup Card for your player count. In a 2-player game, a Workshop is placed in the center Workshop slot for each Guild. Separate the cards into two decks (marked on the back with a 1 or 2). 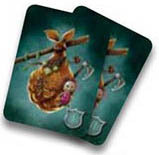 Each player randomly draws one Settlers card from deck 1. Then shuffle both decks to form one deck. 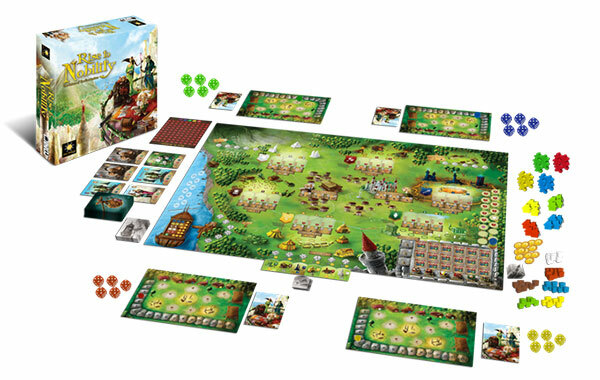 Draw 6 Settlers cards and place them face up near the top left corner of the main board. At certain player counts, some players will begin the game with bonus Modifier tokens. In a 4-player game, the fourth player receives one Modifier token. 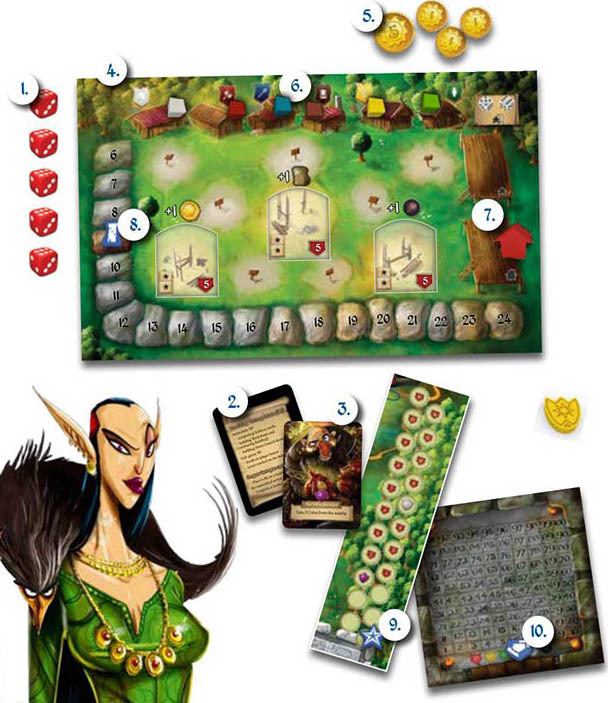 In a 5-player game the fourth player receives one Modifier token and the fifth player receives two Modifier tokens. Place the Meeples, Goods (wooden cubes), Houses, Coins and Modifier tokens to the side of the game board within easy reach of all players. Place the Building tiles in the cloth bag. Chooses a color and takes the five dice of their color. Takes a player reference card. Randomly chooses a Character card. Takes a value of 8 Coins. Takes one Good of each kind. Takes 1 House of their color and places it on their Construction Platform. Places their Reputation Marker on number 9 on the Reputation track of their Player Board. Places their Nobility Marker on the 0 space on the Nobility track on the game board. Places their Score Marker on the 0 space of the Score track. The First Player marker goes to the player who last moved to a new apartment/house. 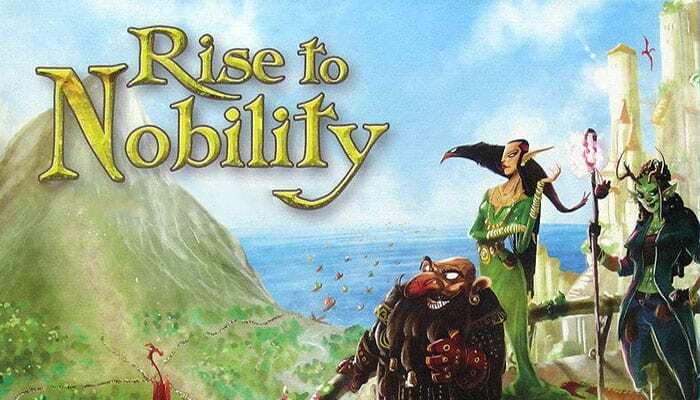 In Rise to Nobility, players take on the role of landowners attempting to rise from anonymity to the rank of lords. 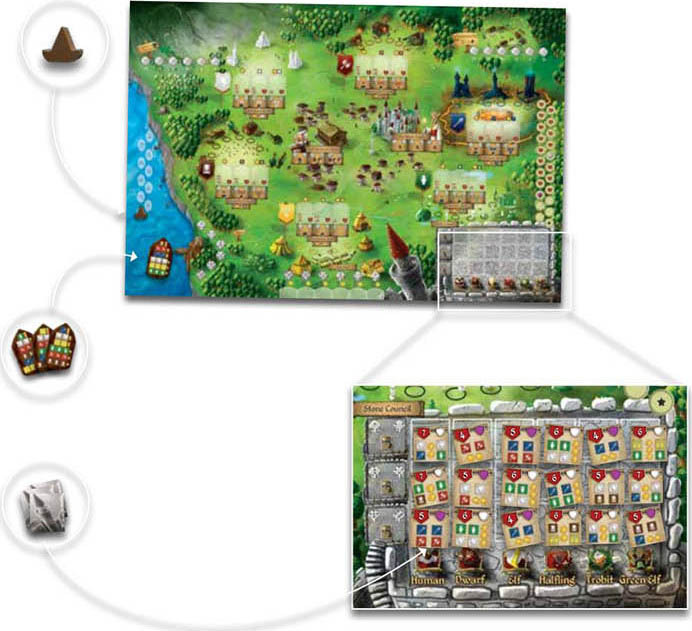 Players gain victory points by upgrading their land value, by housing Settlers and helping them become Apprentices and Guild Masters (it's always good to have friends in influential places), and by fulfilling various demands from the Stone Council. At the end of 10 rounds, the player with the most victory points replaces Berk the Clerk as Head of the Stone Council and wins the game. Rolling Dice Each player rolls the 5 dice of their color. Taking Turns Players take their turns in clockwise order, starting with the player with the First Player marker. Place a die on a location and take the associated action. You may perform these actions in any order. Players continue taking turns until everyone has placed all of their dice or reached their reputation limit and cannot place more dice. After every player passes, move to the Income phase. Receive Coins for your Apprentices (the amount each Apprentice earns is based on the number of Apprentices in the Guild). Receive Goods for your Workshops (1 Good from the Guild associated with each of your Workshops). Receive rewards for your Community Buildings (the reward shown above your built buildings). Resetting for the next Round . Return your dice to your Player Board. Return Goods that were sold on the ship to the supply and place a new Ship tile. Fill any empty slots in the Stone Council with Stone Council tiles. Tiles are placed from top left to bottom right. Fill any empty slots in the Guild Hall by first moving the remaining Buildings in the Guild Hall to the left and then adding new Building tiles into the empty slots from left to right. Pass the First Player marker to the left. Advance the Round marker to the next round. If there is a tie, the winner is the player with the most Houses built. If there is still a tie, the player with the highest Reputation in the City wins. In the unlikely event that there is still a tie, the player with the most Coins wins. And in the ridiculously unlikely event that there is still a tie, all tied players win.